What you need to know about the insane "Brexit" debate happening in Britain right now. 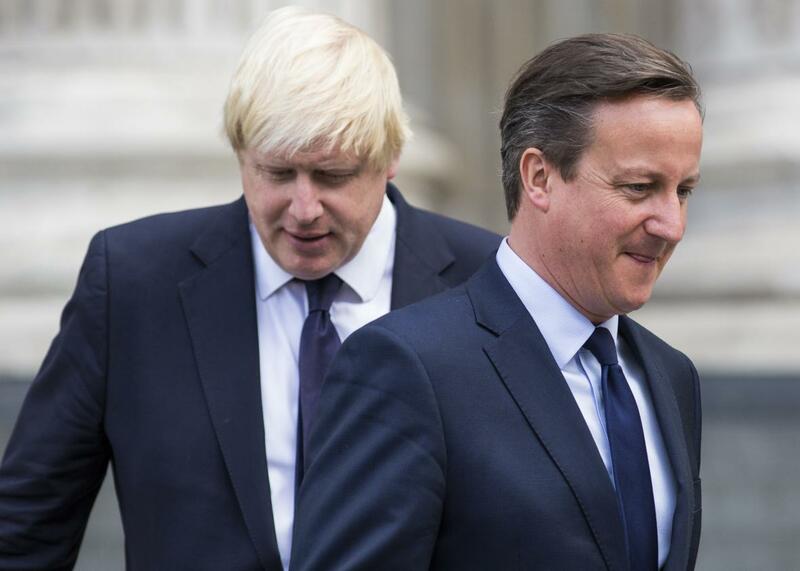 British Prime Minister David Cameron and London Mayor Boris Johnson on July 7, 2015. She was completely wrong, of course. The drama is only just beginning. The debate over a “Brexit”—shorthand for Britain’s possible exit from the EU—now goes to the British voters, with an in-out referendum on EU membership scheduled for June 23. Prime Minister David Cameron won re-election last May, promising to renegotiate the terms of Britain’s EU membership and give voters a say on whether the country should pull out altogether. Cameron got a lot of what he wanted in negotiations with the EU this past weekend, including assurances that Britain can continue using the pound rather than the euro without financial repercussions; a provision that allows national Parliaments to band together to block objectionable legislation from Brussels; and an exception for Britain from the EU’s stated political goal of an “ever closer union.” But Cameron had to make some compromises too, particularly on the contentious question of whether Britain would have to pay benefits to migrant workers from other EU countries, a key British demand that the Eastern European countries where many of those workers come from viewed as discrimination. The deal would allow Britain to reduce, rather than eliminate, these benefits, and only for a limited amount of time. Cameron will now have until June to convince voters that the deal was the best he could get and that EU membership is still worth it. Polls suggest a very narrow lead for the “in” side, but many voters are still undecided. The question is cutting across Britain’s ideological lines in unusual ways. (And I don’t just mean the politicians who started arguing with each other in Elvish on Twitter on Saturday night.) Cameron can likely count on the support of British financial interests as well as the opposition Labour party—though the party’s leader, Jeremy Corbyn, is lukewarm on the question. Members of Cameron’s own Conservative party are divided. The “out” camp has united Britain’s far right and far left, which is already proving problematic. An anti-EU rally in London last Friday ended in disarray with hundreds of attendees walking out after U.K. Independence Party leader and leading right-wing euroskeptic Nigel Farage brought out George Galloway, the leader of the left-wing Respect Party who is known for his hard-line anti-Israel views. Cameron would love it if Farage and Galloway were the most prominent faces of the pro-Brexit camp, but he’s not going to get his wish. On Sunday, London’s Conservative Mayor Boris Johnson announced that he would be campaigning in favor of British withdrawal. Johnson had previously supported the government’s position. He told me in an interview in Washington in late 2014 that “We may want to change our relationship a bit, but fundamentally we will remain within the European common market.” But either the deal Cameron brought back from Brussels was evidently not up to his standards, or he sensed a political opening. The defection of the mayor, widely viewed as Britain’s most popular politician and a likely contender for prime minister in the next election in 2020, is a major blow to Cameron. Johnson is voluble, funny, and extremely good on TV—exactly who Cameron doesn’t want on the other side of this debate. The pound saw its largest decline since 2009 in trading on Monday, due in large part to Johnson’s announcement and its likely impact on the chances for a Brexit. The Brexit debate has also reignited the question of Scottish independence. Support for the EU is much higher in Scotland, and Scottish First Minister Nicola Sturgeon has said that a Brexit would “almost certainly” trigger a new independence referendum. If successful, an independent Scotland would likely try to apply for EU membership on its own. Cameron had hoped that the question of Scotland had been settled when Scots voted to stay in the U.K. in 2014. The prime minister campaigned aggressively, and successfully, for Scotland to stay during that debate. Now, he is once again staking his political legacy on standing up for maintaining geopolitical status quo in a time of upheaval, when prominent voices to his right, to his left, and within his own party are calling for blowing the whole thing up.